Apolinar Aguilar stands over a large iron anvil, heavy mallet in one hand and a pair of long metal tongs gripped around a length of red hot steel in the other. Behind him is a stone and clay hearth; and to one side, feeding air into it, is a rudimentary wood and skin blacksmith’s bellows. These are the tools of the trade in this grand master’s artistic cuchillería or knife-making workshop. Maestro Apolinar is at work on a daily basis, magically transforming old car parts into blades; otherwise unusable bronze plumbing supplies and door hardware into guards and heels; and bone, antler, wood and horn into handles – ultimately producing high quality turkey carving sets, hunting knives, letter openers, cutlery, meat cleavers, paring knives, swords, machetes, martial arts weapons and even the finest of surgical instruments. Apolinar Aguilar is a member of a dying trade, a craftsman who recycles what most would discard, into art; both utilitarian and purely decorative. He and his brother the late Angel Aguilar in fact fashioned the swords used by Arnold Schwarzenegger in the Conan the Barbarian film series. Three years ago a panel of 30 judges, prominent members of Oaxacan society, honored Apolinar with the Fine Arts prize at the annual state Citizens Award of Merit ceremony. He won out over better known craftspeople who work with clay, wood, textiles and canvas. More recently his use of salvage materials was showcased in a documentary, Under the Sun, a series about sustainable living models in different parts of the world. The maestro’s workshop is in the city of Ocotlán, about a 45 minute drive from Oaxaca, just off Highway 175 en route to Puerto Escondido. You can watch him not only hand forge kitchen utensils, outdoor equipment and weapons, but also hand engrave any purchase with whatever strikes your fancy, on the spot. This skillset in and of itself is absolutely remarkable. My good friend Apolinar began learning his craft from his uncle in the 1960s. It’s the exact knife-making tradition which began in Toledo, Spain, and was imported to Mexico in the 16th century during The Conquest. So what you witness today is a legacy of centuries long vanished, in this case persisting as it has been passed down through the generations. But the heyday of demand for high quality craftsmanship has lost ground in this trade. Apolinar laments that in modern times, with our global economy, people seem more interested in price than quality, and are often content to buy a cheap set of knives made in Taiwan or China, and discard them once the edge has been lost. 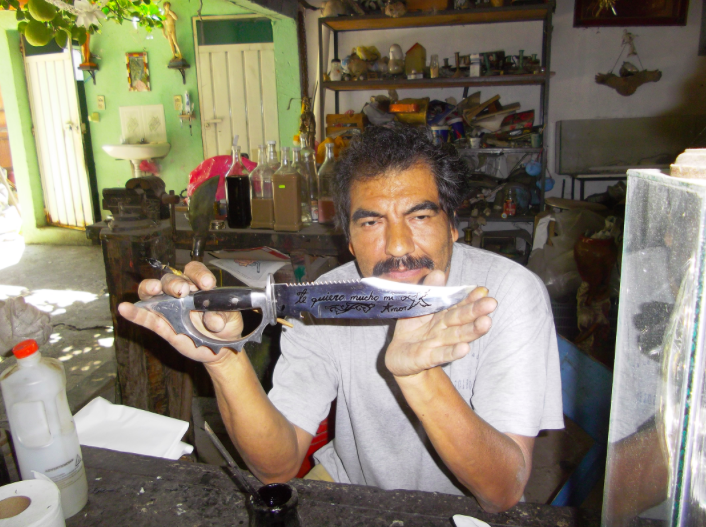 In the course of a demonstration Maestro Apolinar explains and illustrates the importance of tempering in making a blade, whether in fashioning a rigid, razor sharp skinning knife, or for a more flexible machete which must also maintain a high degree of sharpness. And not every steel is suitable for all blades, he explains. As elementary as his English may be, Apolinar is nevertheless able to pepper his informative 40 minute presentation with spots of welcomed humor. His personality is genuine, the farthest you could imagine from a hard sell. He recognizes that what he offers tourists to Oaxaca is a very unique experience, something that they may not be able to see in another 30 years. The diversity of Maestro Apolinar’s products piques the interest of a broad range of visitors, all ages and both sexes. While Apolinar is unaffectedly happy to just show his craft and talent, it’s noteworthy that prices are astoundingly affordable for all, especially considering quality and certainly the time and personal attention which goes into making each and every item. Enjoy and learn from one of Apolinar Aguilar’s demonstrations. Perhaps consider buying a cake serving set for that needed wedding gift, engraved with the names of the bride and groom. Or there’s always the last remaining of the six swords produced for Conan. After all, if one is good enough for Arnold’s own memorabilia collection, and another for The Smithsonian, how can you go wrong? Alvin Starkman and his wife Arlene operate Casa Machaya Oaxaca Bed & Breakfast (http://www.casamachaya.com). They have been friends with Apolinar Aguilar since the mid-1990s. Alvin frequently takes tourists interesting in seeing Oaxaca’s central valley sights to his cuchilleria.